Posted on Thu, Mar 29, 2012 : 5:59 a.m.
Last week's column centered on the events on South University during "March Madness" in years gone by when the University of Michigan Men's Basketball team made it into the Final Four in 1992 and won the National Championship in 1989. Alcohol-fueled crowds of revelers took to the streets to celebrate, but at some point someone in the crowd decided to break something and it set off a chain reaction. "Mob mentality" replaces common sense in those who think they are anonymous in the crowd and won’t get caught acting badly because they can blend into the sea of people. There is less anonymity in crowds today as police and security forces have learned the virtues of video cameras. In years past, we found that most of those who got caught committing crimes at these "celebrations" were not University of Michigan students, who have much to lose if arrested. Most of those revelers who trash the town are just people who came downtown for the spectacle and to be a part of something big. At some point, a few decide destroying public and private property is more fun than creating a joyful celebration. 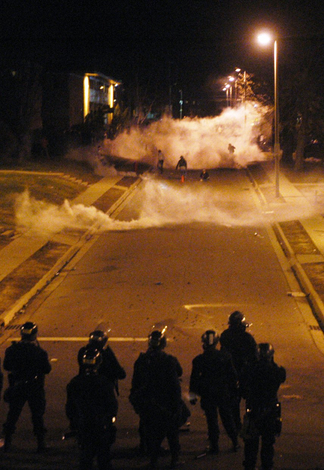 In 2005, East Lansing police in riot gear stand at the end of a street after releasing tear-gas to disperse a crowd of rowdy Michigan State fans after the Spartans lost their Final Four game to North Carolina. Ann Arbor saw similar scenes in 1989 when U-M won the National Championship and again in 1992 when Michigan made it into the Final Four. These nighttime March Madness “celebrations” were not fun-loving and sober pep rallies where bands play, coaches pump up fans and discarded floats and broken pallets are used for the bonfire. These street celebrations turned ugly in an instant. Spilled beer, littered cups and dropped beer bottles can turn quickly to fights, broken windows, overturned trash cans, dented cars, torn awnings, uprooted street signs and parking meters, overturned cars and burning sofas. This bedlam has also concealed thieves who leave the “celebration in the streets” to break into cars and loot unlocked unattended off-campus student housing — because the cops are too busy just then. I have witnessed all of these events working “crowd control” assignments. Different police chiefs had different plans for controlling the crowds. Certain strategies worked, some did not. In 1992 we decided to deploy tear gas to clear South University. We did, and it worked, but we failed to leave “rear guards” to block the sidestreets we had already passed. The result was that the mob backfilled behind us, and we had to clear the street once again in the other direction. It was that same year, as I recall, that we “tactically withdrew” through the East Engineering arch and across the Diag while there were still quite a few people left in the street. The line officers saw this as a “retreat,” and morale was low as we trudged back to the station. The most amazing lesson I learned came in 1989 when I finally made it to my assigned squad after wandering through the crowd past them several times. They saw me and tried to pull me in to the group, but could not part the sea of people to get to me. We moved quickly through the crowd staying together. Someone made the mistake of spitting on “Stryker’s” back. “Pit Bull” saw the culprit and gave him a shove that landed the spitter on his keester. During large-scale police operations there is no time for arrests for “minor” incidents. On any calmer evening, “the spitter” would have been “hooked and booked” — arrested that is. We continued on, around the corner by Rick’s Cafe and east toward the old carport. After we rounded the corner we noticed the crowd was now pursuing us. They were angry their spitting pal had been toppled. It is rather disconcerting having a whole alley of several hundred people angrily on your heels. We turned to face them. We stood four abreast helmet shields down and batons at port arms. It looked like there were hundreds in the angry mob, but a funny thing happened. They stopped and suddenly there was about a 30-foot gap between them and us. I suggested that we slowly back toward the mouth of the carport, which would narrow the area we had to cover so the crowd did not surround us. The roof of the carport would also shield us from incoming projectiles. Most projectiles are lofted from the back of the crowd, as opposed to thrown straight at the officer, because the assailant does not want to be seen by the cops. As if on cue, the bottles started raining in on us until we made it to the mouth of the carport. Our next move would be to the stairwell if the crowd advanced on us — which they never did. One green beer bottle was thrown straight at us and would have passed between “The Energizer Bunny” and me, but he fancying himself a softball player. He reached out and batted the bottle with his nightstick. After the crowd ran out of beer bottles, some found chunks of cement from a nearby construction project. Those got launched for several minutes, but we stood firm and no officer got hit. Finally the crowd got bored and left as fast as they had formed. We checked the rest of the carport and, of course, there was no fight. That just four well-trained, properly equipped, determined individuals could make a stand and hold off a bottle- and rock-throwing mob seemed incredible to me. There is a tremendous bond that forms between officers when they face “interesting” situations together, like that angry mob. We rejoined our squad and the squads formed into large ranks. We cleared the streets and held them until the crowd went home. Only one officer was seriously injured that night when a rock was baseballed at his head and broke the lens on his gas mask as we started to clear South University. We all took a few bumps 'n' scrapes, but we made it through the night and kept property damage to a minimum. Fri, Mar 30, 2012 : 9:35 p.m.
Are we going to have to wait for Crowd Control III or IV or V to find out how police handled the miscreants of the Michigan Naked Mile? Sat, Mar 31, 2012 : 5:13 p.m. I went out to see that one year. It was really sad to see all the people with video cameras, and that the runners had to run through a bunch of people reaching out to grab at them; some took alternate routes to avoid that. Other than that, it was good to see people self-confident enough to run naked through a crowd, and brave the consequences of our stupid laws. I would like to believe a good portion of the crowd cheered on that spirit. Fri, Mar 30, 2012 : 5:18 p.m. So officer Pitbull assaulted a citizen and then was surprised that the crowd turned on them? Sat, Mar 31, 2012 : 8:09 p.m.
How dare you push (I mean &quot;assault&quot;) a guy who is brazen enough to spit on a cop. Ben, you're right, the whole incident was calmly observed by the crowd and they were merely trying to remedy an apparent injustice. Thu, Mar 29, 2012 : 5:20 p.m.
Mobs throwing rocks at Kent State had a different ending. Thu, Mar 29, 2012 : 2:15 p.m. When the police &quot;retreated&quot; in 1992, they left behind an angry mob of drunken tear-gassed hooligans. This mob started setting things on fire and attacking any cars that had the misfortune to drive through the area. South U turned into a very dangerous place at that point with no police presence to stop an increasingly violent mob. Having seen how this played out in person, I'm convinced that the best tactic for the police to employ in this kind of situation is to start making arrests. Even after warning the crowd to disperse, the police made no arrests. The crowd saw this as a game, realizing that they could retreat a block or two and then could come back after the police passed. Also, a lot of people stuck around watching, adding to the size of the crowd, because there was no incentive to leave. If the police had started cuffing the leaders of the pack, you can bet that a lot of the hanger-ons and people who were acting tough because they were in a crowd would have had second thoughts and departed. I'm not one to advocate for a heavy handed approach by the police but at the point that the crowd started to get out-of-control, the police would have been well within their rights to start making arrests. Thu, Mar 29, 2012 : 1:22 p.m.
Thu, Mar 29, 2012 : 12:49 p.m. I do not think Ann Arbor has to worry about any Michigan sport celebration riots for awhile. i.e. (Football or Basketball) The last riots were when half of the present student body was not even born! Wishing for days gone by! Thu, Mar 29, 2012 : 12:40 p.m. Sad commentary. Ann Arbor is an overly permissive town. The town elites (faculty, UM senior management, local politicians) call it progressive, inclusive, etc. At the end of the day, you have panhandlers' paradise, home invasions, rioting over a sporting event. When property values are impacted, the elites will be the first to whine. Ann Arborites get exactly what they condone. Fri, Mar 30, 2012 : 2:06 p.m. The progressiveness of Ann Arbor has far more benefits than downsides. So thanks, we'll keep living here and enjoying it. Thu, Mar 29, 2012 : 11:41 a.m.
With facial recognition software approaching 100% accuracy people should know that they will be held accountable. England was able to arrest hundreds of looters in the recent London economic riots courtesy of video. I recall my first protest turned mob was the early Nazi rally at the Federal Building. We were up close to the action and I remember thinking this is not where I want to be when the batteries and rocks started flying at the Nazis. Windows were busted out. An African American gentleman in the Federal Building drew his service weapon and was pointing at the Nazis and crowds who had busted out the big glass in front. The Nazis were swinging their signs/aka clubs at protestors. From then on I avoid mobs or large scale celebrations that turn ugly real quick. When rocks and bottles are lobbed at police it's easy to be hurt as a mob participant as well, and you're not wearing a helmet and riot gear. Obviously alcohol fuels the violence in most big mobs in Ann Arbor. Thu, Mar 29, 2012 : 11:32 a.m.
Doug Harvey knew how to handle a roit, the good ole days. Thu, Mar 29, 2012 : 11:10 a.m.